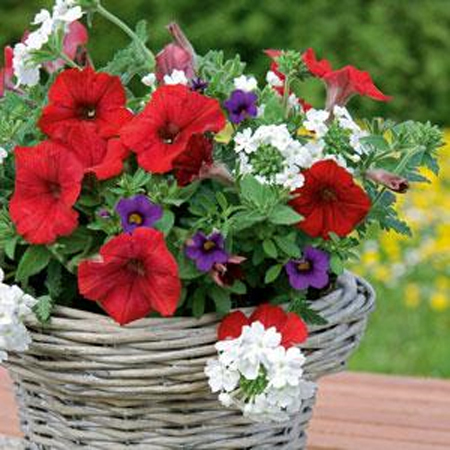 Our Trixi® 'Liberty Bell' Flower Combination is the ideal combination planting to have in bloom as you celebrate the birth of our great nation. 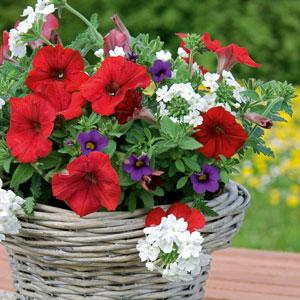 Fighting for center stage in this flowering combination is Petunia Fame™ Fire in vibrant red and Verbena Lascar™ Compact White; though we would have to say they both demand equal attention. The mediator, or filler, in this combined planting is the MiniFamous Compact Dark Blue Calibrachoa. Liberty Bell will stand up to the heat of the summer and is practically carefree. 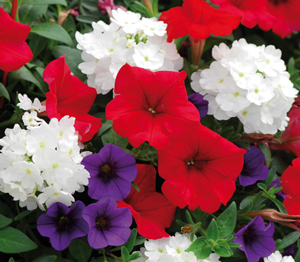 Our 'Trixi Liberty Bell' plants are grown and shipped in fine quality growing medium and are guaranteed to arrive alive and ready to thrive.